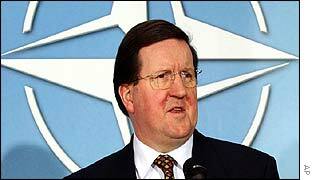 In the past, Nato has often taken difficult decisions with remarkable speed. The alliance has been rocked by disputes many times before. But the context of this crisis is remarkably different, and its ramifications could be significant. At stake is not despatching forces to Turkey, but just the preliminary planning - so as to be ready to do so if war threatens. These forces - mainly air defence units - would not be involved in a war against Iraq, but would protect Turkish territory and airspace against any retaliatory Iraqi threat. French and German opposition to Washington's Iraq policy is clear. But the fact that - along with Belgium - they have chosen to force this disagreement to the top of Nato's agenda will have serious consequences. In practical terms, Turkey will still be defended. The Bush administration has given its commitment that the Ankara government will get whatever it needs. And the Dutch have already said that they will ship Patriot anti-missile batteries to Turkey - a clear indication that the Netherlands for one does not agree with the French position. But with Nato more and more uncertain about what its future role should be, the bad blood between Paris and Germany on the one hand and Washington on the other could have a corrosive effect on the functioning of the whole alliance. Senior US officials are said to be incandescent at the French Government's behaviour in particular. The fact is that Nato's European members are deeply divided - so divided it seems that they cannot even agree to plan to assist one of their own allies who may be under threat. But that of course is precisely what Nato's principal role is supposed to be. "I want an alliance that unites in the face of a common threat"